The intraoperative use of TEE is increasing. Dr. Milas notes that differentiating hypovolemia from pericardial tamponade is often critical in determining resuscitative measures in the hypotensive patient. The TEE assessment of hypovolemia versus tamponade can be challenging to the untrained observer. When examining a TEE image, it is best to first identify the cardiac structures to orient the image. The thicker walled left ventricle is usually easy to identify, and then proceed with identification of adjacent structures based on normal anatomy. The key element of the differential diagnosis is to identify that the patient has a moderate to large pericardial effusion. This appears as an echo lucent (black) space around the heart. It is usually circumferential (and therefore seen in multiple images), but in the setting of trauma or post-cardiac surgery the fluid collection may be localized and smaller in size. Localized effusions are frequently clotted blood or fibrinous debris, which would appear echo dense (white or gray). 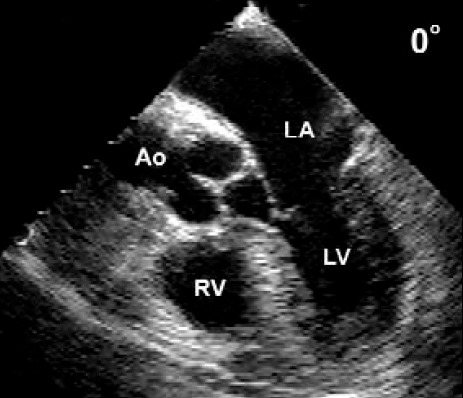 Whether circumferential or localized, pericardial tamponade is a consequence of increased pericardial pressure that causes diastolic collapse of one or more cardiac chambers (usually right sided initially, because the intracavitary pressures are lower in the right heart, and the RV is thinner walled than the LV). Usually RV free wall collapse is seen early in diastole and the RA wall collapse is seen late in diastole and persists into systole. RA collapse lasting longer than one-third of the R-R interval is specific for cardiac tamponade. Typically in tamponade the heart is tachycardic, LV end diastolic volume is low (the dark LV central cavity is small, it appears empty), and the LV function is normal to hyperdynamic (dependent on the baseline LV function). Additional findings of tamponade include ³25 % respiratory variation of mitral valve and tricuspid valve inflow (increased tricuspid valve inflow with decreased mitral valve inflow during inspiration, and the inflow patterns reverse with expiration, image 2). This variation of right and left heart inflow is a sign of exaggerated interventricular dependence, which is also a hallmark of pericardial tamponade. In comparison, the echocardiographic findings of hypovolemia can be similar in that the LV is usually tachycardic, under filled, with normal or hyperdynamic function. However, all cardiac chambers are uniformly under filled without compression. In addition, and most importantly, a significant pericardial effusion is notably absent (image 3). 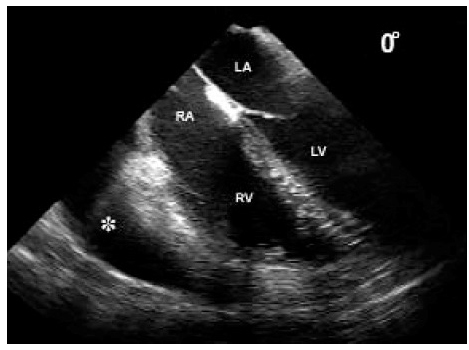 In both hypovolemia and pericardial tamponade chronicity, presence of prior LV wall motion abnormalities or global dysfunction, and treatment of volume status may alter echocardiographic findings. For exam purposes, the likely demonstration would be in an acute, untreated, previously normal ventricular function patient. REFERENCES: 1) Beaulieu Y, Marik P: Bedside ultrasonography in the ICU. Critical Care Rev. 2005;128:1766-81. 2) Burns J, et al: The role of transesophageal echocardiography in optimizing resuscitation in acutely injured patients. J Trauma. 2005;59:36-42. 3) Colreavy F et al: Transesophageal echocardiography in critically ill patients. Crit Care Med. 2002;30:989-996. 4) Memtsoudis S, et al: The usefulness of transesophageal echocardiography during intraoperative cardiac arrest in noncardiac surgery. Anesth Analg 2006;102:1653-7. 5) Niendorff D: Rapid cardiac ultrasound of inpatients suffering PEA arrest performed by nonexpert sonographers. Resuscitation 67:81-87, 2005. 6) Reichert CL: Transesophageal echocardiography in hypotensive patients after cardiac operation: Comparison with hemodynamic parameters. J Thoracic Cardiovasc Surg. 104:321-326, 1992.